June is a weird month for me. I love it and I don't. It wasn't always like that though. 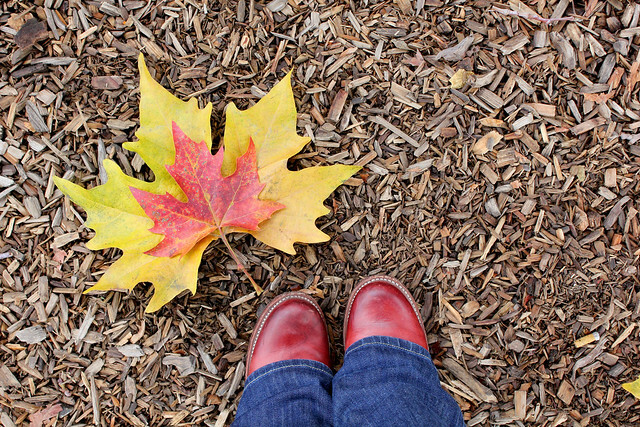 Growing up I loved June - it's the month of Father's Day (and I absolutely adore my Dad and I just happen to be 'Daddy's little girl'), warmer weather, and because not only was it the last month of school before summer holidays, but it was also my birthday month. Then a few days after my 20th birthday I got into a pretty serious motor vehicle accident and that all changed. Now, June is a "meh" month for me. I like to think I don't dwell on things like that, but I guess both my body and my subconscious mind remember all too well still. Without realizing it I spend the month stressed out and anxious, overly tired, and with that, constantly feeling unmotivated to do anything other than to veg and zone out. This year this June has been no different...well, except that I also had that stupid concussion (insert big sigh here). Usually things go back to normal by mid-July and I'm really, really, really hoping that this will be the case this year too...although granted I'll still have to deal with post-concussion symptoms (blegh). Fingers crossed that July is full of nothing but sunshine, lollipops, and rainbows. And yeah, maybe some yarn. Please! I'm not sure if this is the work of my subconscious here trying to cheer me up or the fact that Pride Week has been happening around the world and is currently happening here in Victoria, but I've got rainbows on the brain. 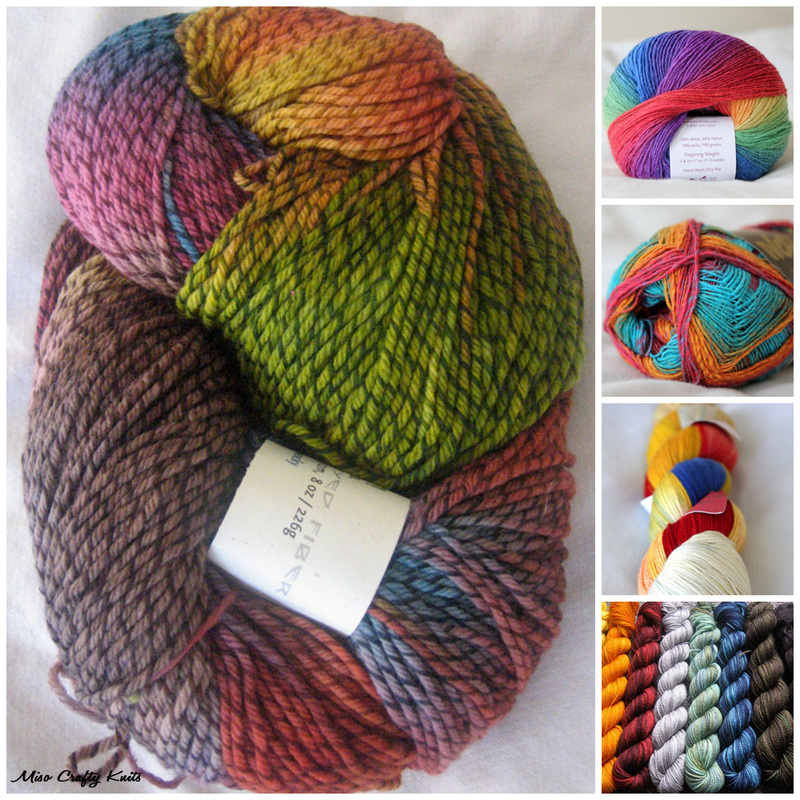 Rainbows in yarn form, to be more precise. 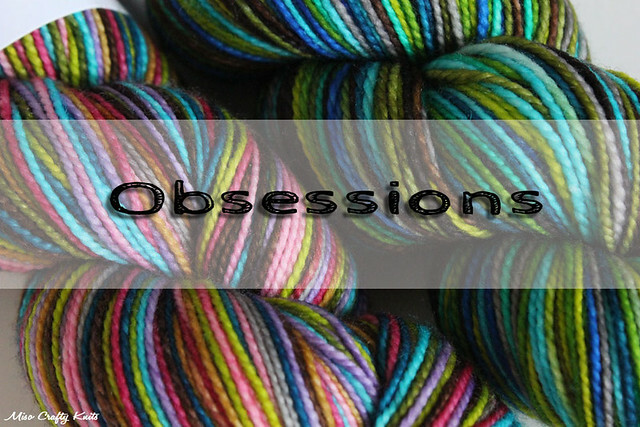 I would like to say that I'm a fan of rainbow barf, but really, I prefer my rainbow yarn to be in self-striping or long colour repeat/gradient fashion, and I could/would never turn down minis (or even full skein for that matter) presented in a rainbow formation. The Fish Lips Kiss Heel by Patty-Joy White (aka SoxTherapist) has been on my sock knitting radar for almost a year now. At the beginning of the pattern's release I didn't pay much attention to it as I was only knitting socks occasionally, but now that I've become an avid sock knitter this highly raved about new heel method has been brought up in practically every conversation I've ever had about socks and more specifically, heels (especially since the last few pairs I've knit have been self-striping...and I've got strong feelings about how my heels should look when it comes to that type of yarn!). I have always been intrigued by this heel and have wanted to give it a try, but for some reason I never got around to even buying the pattern. I don't know why considering that the pattern is a mere dollar! Yes, you read that right. A dollar! Well, after much conversing with other sock knitting lovers I decided that it was time to give the Fish Lips Kiss Heel a try. So I bought the pattern, immediately downloaded it to my tablet, made a mug of tea, and settled down to read over the instructions. Well...I have to admit that I was a little bit intimidated that the pattern was 16 pages long. The Ravelry page did specify that this was more of an ebook than your typical pattern. But 16 pages?? For a heel? What? I thought this heel was suppose to be easy peasy? Let's just say I got myself slightly worked up for nothing. An initial skimming of the ebook told me that this was not 16 pages of just written instructions or of a heavily photographed step-by-step knitting lesson. No, instead this ebook gave not only directions on how to knit this heel (which actually does look easy peasy), but how to knit it toe-up AND cuff-down. 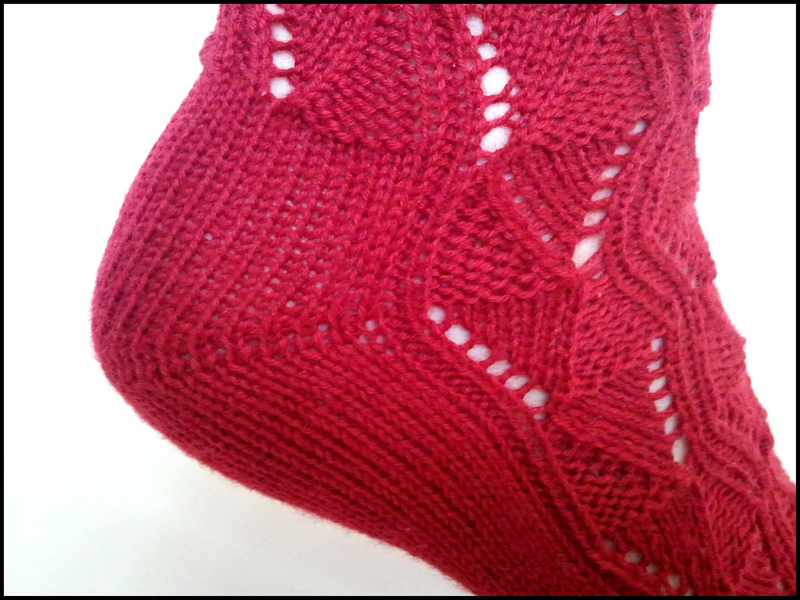 There is a simple photo tutorial on how to knit the special stitches needed for the heel, but it's not photo laden, just to the point. There's also a video tutorial on YouTube (done by the designer herself) for those who need even more of a visual to get the stitches down pat. I appreciate the explanations and reasonings of what makes hand knit socks so different from commercial socks and what steps knitters can do to make their hand knit socks have a better, if not perfect fit. But all of that doesn't take up 16 pages. No, there's a great section to help make not only your own, but any sock you knit for others a perfect fit. I'm not a fan of math but I am a knit nerd that totally appreciates the formula on how to calculate your "hinge line". Trust me, it felt like magic! I'm super excited to knit up the FLK heel and have cast on a pair of plain vanilla toe-up socks just for this purpose (I know, I said my next pair wouldn't be plain vanilla...but hey, July is going to be a busy one, so I need a small mindless knit on the go). I'll keep you posted once I knit up the first heel. In the meantime, if you've tried this heel let me know what you think! If you haven't yet but want to, head over to Ravelry and grab your copy. Or just click this link for Fish Lips Kiss Heel (don't worry, I'm not an affiliate or making any profit from that link!). Yeah, yeah, I know...summer has just started and already I'm thinking about knitting for fall and winter?? You bet I am! Don't get me wrong, I like summer just as much as the next person, especially since all my favourite fruits and veggies come into season and I can gorge on them without having to fork over my first born. But let's face it, the warm weather doesn't really allow for either the wearing of or the knitting of hand knits - unless you're in front of a fan 24/7, work in an air conditioned environment, or have access to an air conditioner. So during this time, what do you knit? As much as I love socks and shawls, I long to knit pullovers and cardigans. I normally don't let the weather affect what I knit, but last weekend was sweltering hot enough that I just had to stick to socks, even though I was dying to work on the tunic that I had cast on late last week. I don't want to complain, so I'm not going to. But I will be dreaming of all the lovely sweaters that I want to knit and wear for fall. Throughout my life I've always been about lip products over any other kind of makeup - lip balms, lip gloss, lip stains, lip liners, lip plumpers, lip treatments...if it was for the lips, I was on it. As a little kidlet I had the Tinkerbell lip balm tucked away in my Betty Boop handbag and as I got older I had every flavour of Lip Smacker I could get my little hands on. In high school I was obsessed with Revlon's Toast of New York lipstick (um, who wasn't though? It was the quintessential lip colour of the 90s! Man, I feel old!). In my 20s I was all about the MAC lipglasses. But always, always was I on the mission for the perfect lip balm (which I found in Kiehl's Lip Balm #1 AND in Hurraw! Balm). So what is it now? Red. The perfect red lips that doesn't make me look gothy or like I have jaundice. Red in general is such a statement colour. And red lips, when worn with the right amount of makeup, can look so classy and composed. Even when worn with a simple pair of jeans and a t-shirt, red lips can automatically make you look dressy without trying. 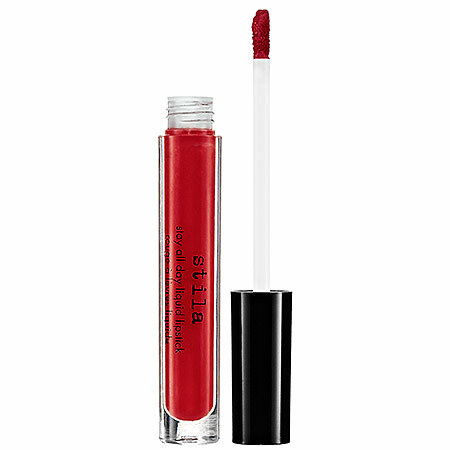 For a while now I've been on the search for the right red lipstick and I think I finally found it in Stila's Beso (yes, the very same one that Blair of Atlantic-Pacific wears). I've been trying to wear it every opportunity that I can and have to admit that I feel pretty glamorous when I do. And yeah...a little self-conscious. I always feel like my skirt is tucked into my underwear or like there's food smeared on my face when people look at me for too long. Just kidding. Ok, not really. I know what you're thinking, you're thinking "didn't Melissa state that she was obsessed with strawberry-basil kombucha in last month's Obsessions list?". And you know what? I did. And I still am obsessed with strawberry-basil flavoured kombucha. But I'm also obsessed with ginger flavoured kombucha as well. Shortly after making my first round of the aforementioned strawberry-basil kombucha I decided to give ginger a try next. Mainly because I had stripped my basil plants clean (I can't say no to caprese salads!) and because I had loved the Gingerade version by GT's Kombucha. 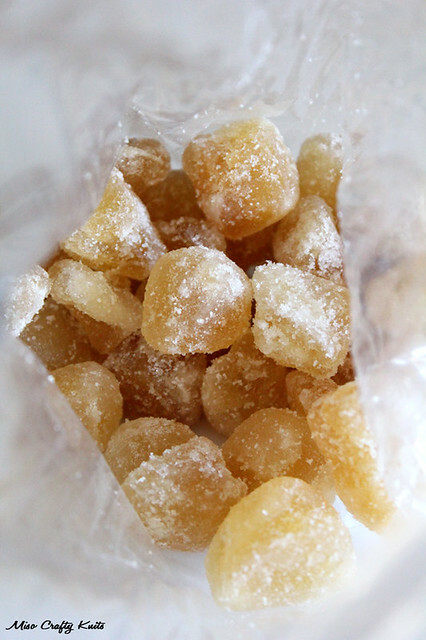 I've read that a lot of people preferred the taste of crystallized ginger over the fresh ginger so I headed over to my local grocer and bought a small bag of Australian crystallized ginger, sliced open a bunch and threw it into a bottle for a second ferment. O...m...g...!! I am NEVER buying another bottle of store-bought ginger kombucha again! Or even ginger ale for that matter. It was seriously the.best.drink.EVER!! I'm in love. There's no turning back now. Homemade ginger kombucha owns me. Luckily that same local grocer had a sale on crystallized ginger recently and you can bet that I stocked up to the max! If you make your own kombucha and you haven't tried adding crystallized ginger, I HIGHLY recommend it! SO insanely delicious!! So delectable in fact, that I prefer it over my other usual summer time beverages (like frappuccinos and Tim Horton's ice caps...both of which I can no longer drink anyways and surprisingly don't miss!). So what was on your mind throughout June? What are you looking forward to this summer? I've got some stuff going on that I can't wait to share with you! But I'll save it for another time, I've got a picnic lunch to make and pack up for the kidlet and I on this beautiful Friday. Thanks for reading! !